Jenni was the first bride to contact us after we had established Hey Look last year. Already then she had a very clear picture of what she wanted their wedding to look like: vintage-playful, yet romantic and elegant with Finnish influences as well as American ones. Already at that point she had collected and made a bunch of decor stuff and over the course of the year more and more was added to the list. In the end, the bride and groom contributed two cars full of props, vases, votive glasses and other decor bits and pieces. On saturday finally the big day had come! 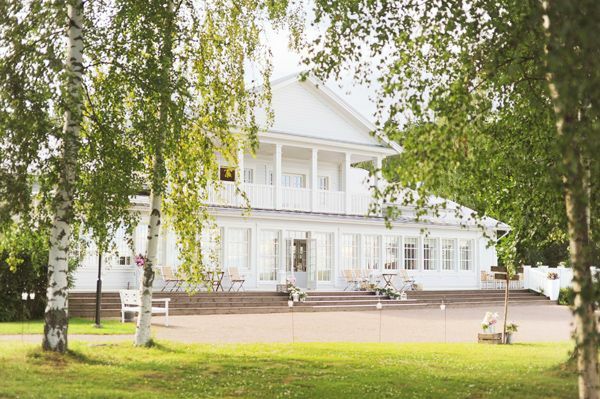 The wedding ceremony was held in Porvoo, the reception at Villa Haikko, a beautiful venue by the shore set in the Haikon Kartano park and forest surroundings. The perfect spot for Jenni's & Calle's vintage wedding. We arrived with two cars full of own props & loads of flowers in the morning, the sun was shining from a bright blue sky. Jenni, Calle and some helpers were already setting up lanterns and signage in the yard of the venue. After the bride & groom headed to get ready for their wedding, we threw ourselves into making floral arrangements and styling the space. 7 hours later, we were ready and the place looked like this. 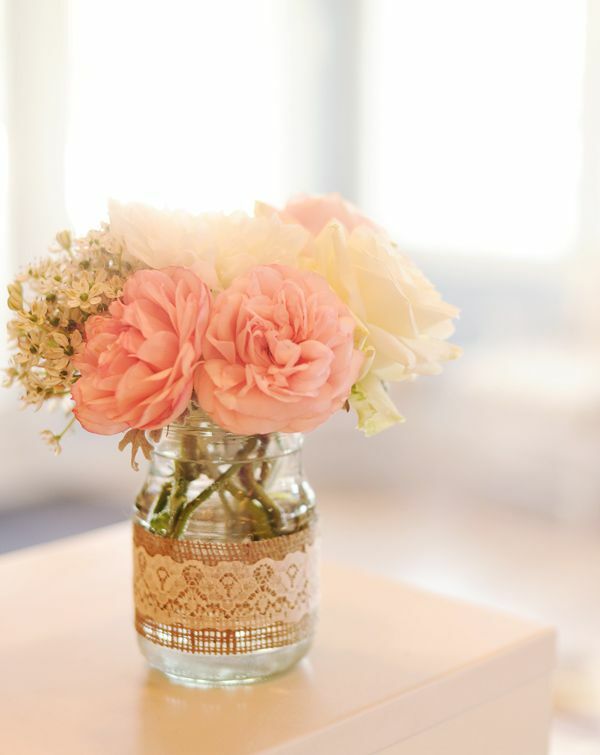 A total of over 100 floral arrangements, more than 150 votive glasses and many many props. Jenni had wanted her bouquet to be made of soft pink peonies and after some weeks of uncertainty, we did manage to grab the final peonies of the season, yay! The bridesmaid bouquets were made of cream colored florals on a bed of dusty miller greens. 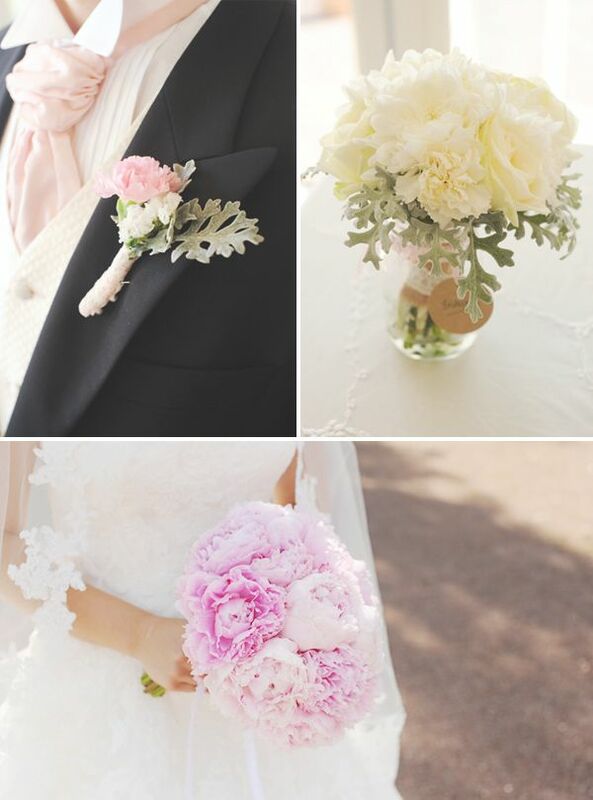 The boutonniere for Calle was made from a wee pink carnation, white florals and dusty miller. The large backyard of Villa Haiko was lined by lanterns set up by Calle and the groomsmen. They also made and set up this lovely Happily Ever After sign. We decorated the steps on the entrance area with large floral arrangements, lanterns, other props and welcome chalkboard signage. Guests found their seats on a seating chart drawn onto two old windows that the bride had brought to our studio weeks before the wedding. One of our favorite details was the memory shelf we set up from wooden boxes. It contained pictures of the bride & groom, wedding photos of their parents, the story of how Jenni & Calle met from each one's point of view and the very first baby shoes of the couple. What a sweet idea! We folded pages from old books to create the couple's initials and decorated the shelf with flowers, succulents and vintage doilies. 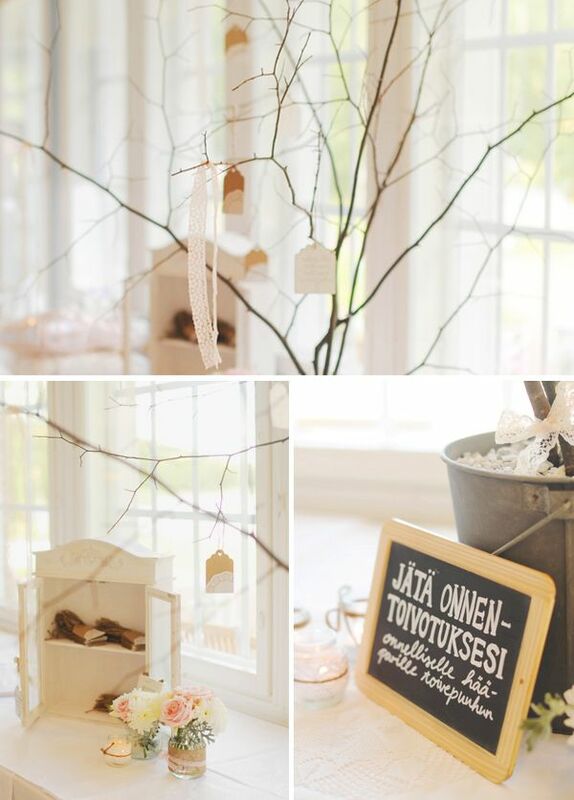 Instead of writing into a guest book, Jenni's and Calle's guests wrote wishes to the newlyweds on little tags and hung them onto a wish tree. 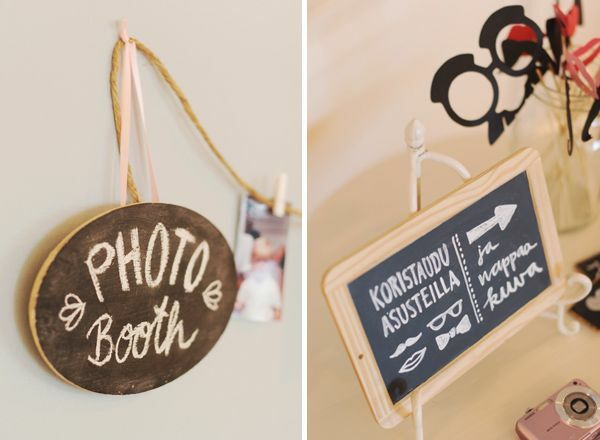 Guests could also snap their own pictures in a "photobooth" decorated with old pictures of Jenni and Calle. For the gentlemen we set up a little cigar bar. We also set up a dessert table with loads of yummies. 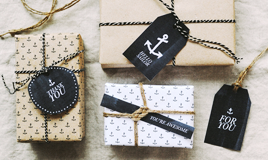 Labels were made from simple recycled paper decorated with doilies or lace ribbon. 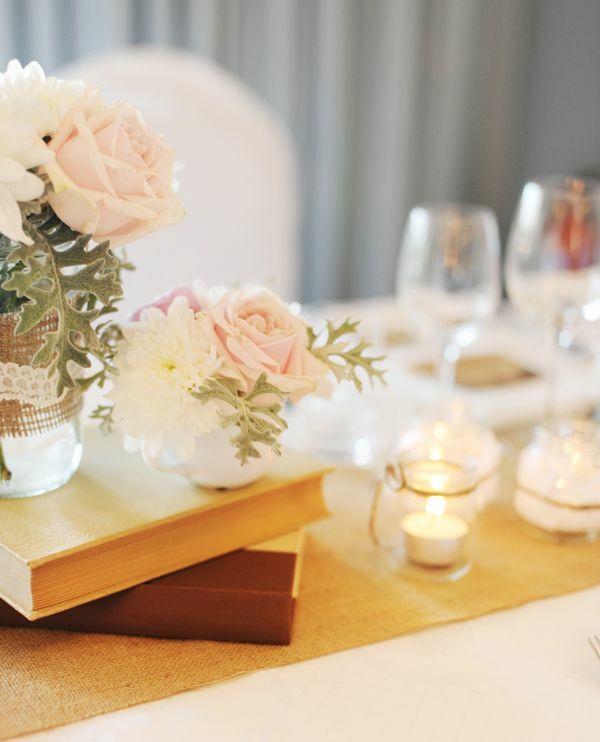 The dinner tables were lined with burlap table runners topped with vintage books, votive jars + loads of floral arrangements in jars and vintage tea and coffee cups. We decorated some of the jars with burlap and lace ribbon to match the votive glasses the bride had made beforehand. 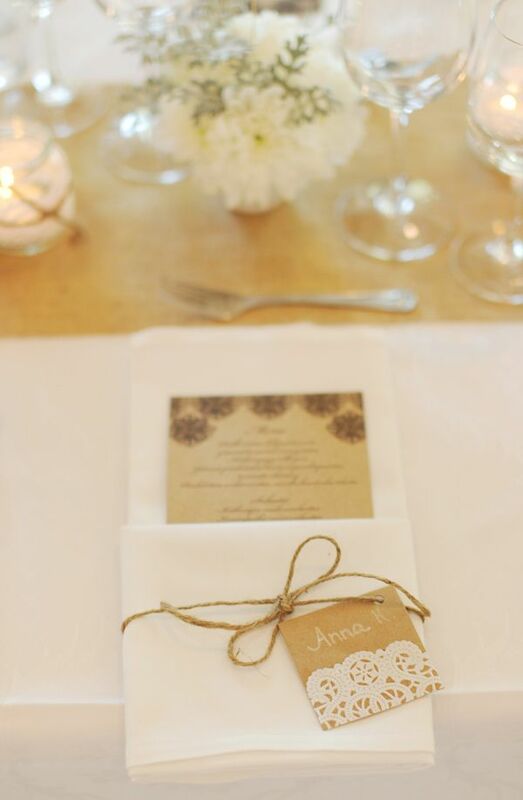 Each place was set with a menu card in a pocket folded napkin tied together with package string and a handwritten place card (the bride and her bridesmaids had folded and tied these the previous evening). 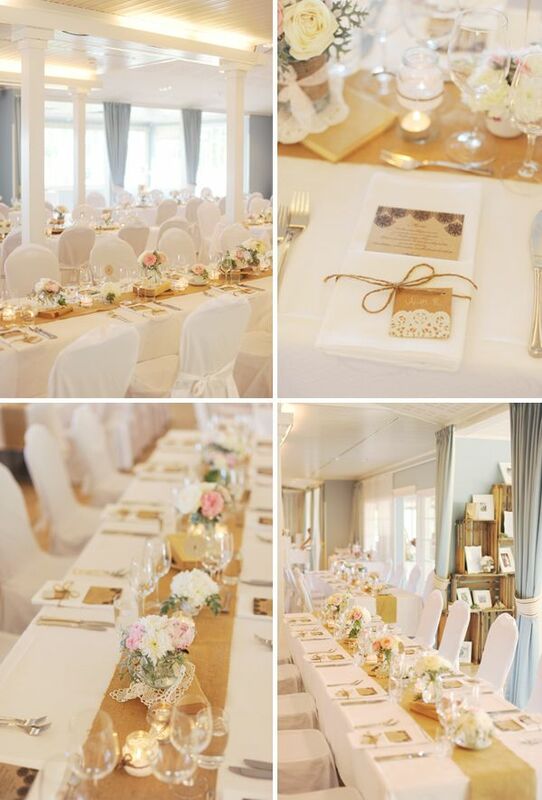 Thanks Jenni & Calle for letting us be such a big part in creating your big day! All the best for your start into the new life as a married couple. We're so happy for you! Wow! The first Finnish wedding that looks totally like an American one! :D Just beautiful! Wow, en ole varmaan ikinä nähnyt kauniimpaa häälookkia! Harmi, että omat häät ovat jo takana;) Tosin meillä oli aika paljon samaa tyyliä. Upeaa työtä! Decoration and arrangement of marriage are quite amazing and adorable. And bride with pink flowers is looking awesome. Beautiful and very romantic. I bet bride and groom were more than happy with your styling!!! Your photos are so lovely! You look so perfect together. Your pictures made me reminisce my wedding held at the wedding halls in Long Island. It's also full of wonderful memories. When I was young, I never dreamed of getting married. I hated all men. They made my girlfriends cry. One day, at my bestfriend's wedding day, I met a man. I never thought that I would be marrying that man tomorrow at suffolk county catering halls. We'll also have paper roses and laces on our tables. Love is really a wonderful thing. It could turn our world around. OMG, I am soooo loving this theme! I will get married too very soon! And this gave me the greatest idea ever. THanks for posting this! 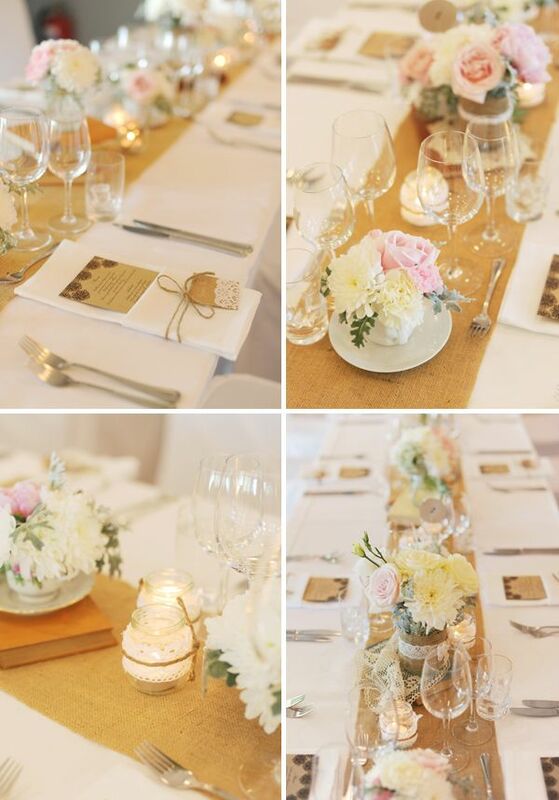 I absolutely love vintage style weddings and vintage dinner sets ! We are planning our wedding for next year with a vintage theme in an alternative venue and I really want something like this as it will go with the theme! The decoration is so beautiful! It's just wow! That is really sweet and touching composition. I think, that that is a good idea to make those celebrations as individualised as they could be. Great post and awesome photos. What filter did you use for them? Wedding invitation card is one the important aspect of making any marriage special.